We look forward to the return of Celsius each season. 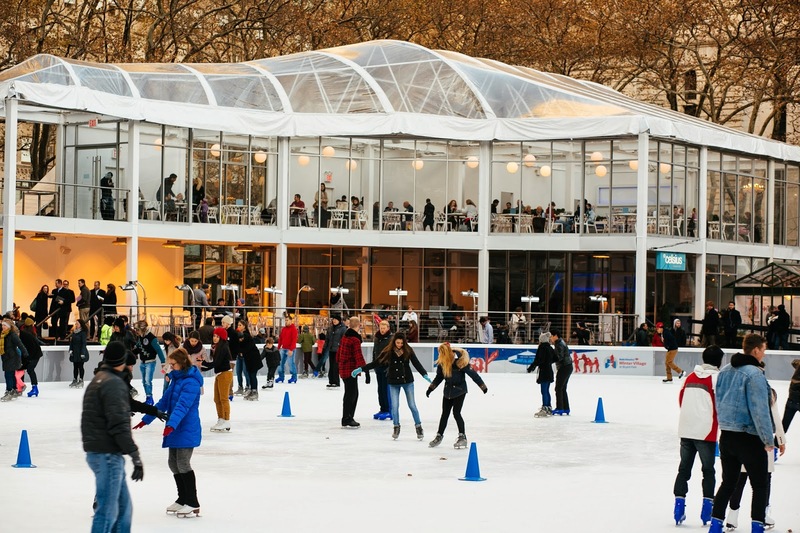 Our winter pop-up restaurant sits at the northeastern edge of the ice rink each November through February. The soaring two-story structure is perfectly situated for stunning views of the skaters below, the Library to the east, and the twinkly skyline to the west. It's a highlight of every visit to Bank of America Winter Village. With multiple scenes within and without, there is a setting for every mood at this large venue. Gather round the comfy couches in the lower outdoor heated level with your family after a long day of shopping, or perch upstairs for a speedy business lunch on weekdays. Celsius is also a favorite spot for cocktails in the evening, and special occasion parties - tell your boss to plan your next holiday season gathering accordingly! Celsius has a large menu with starters and salads, entrees, cocktails, heart warmers, beer, wine, and dessert. Enjoy some selections from the menu below. Click for larger images of our selections below. These make a great appetizer to share, or entree if you are looking for a smaller portion. With honey-blue cheese dressing, these boneless bites are a fun twist on classic wings. Sourdough bread and New York cheddar cheese come with warm tomato bisque soup. Candied walnuts, dried cranberries, and gorgonzola top this light and pleasing mix. Topped with tomato, avocado crema, and melted buffalo mozzarella. Sandwiches are served with a choice of salad or battered fries. This fish dish comes with roasted pumpkin and a slightly sweet sauce, while quinoa adds texture. This generous helping is topped with bacon for a hearty classic. Some areas of the restaurant may be closed occasionally for private parties, and tables at Celsius become a hot commodity, when the rink is busy on the Holidays and weekends. Celsius does not take reservations. All of that being said, the restaurant is large, and can often seat you right away during the day time.